← At last! An end to not-understanding-evolution misery! 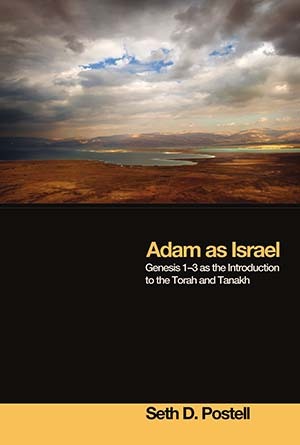 I’ve just finished Seth D Postell’s 2011 book, Adam as Israel: Genesis 1-3 as the Introduction to the Torah and Tanakh, which although perhaps a little scholarly (ie interactive with the “academic literature”) for the average reader is a great eye opener in considering the whole question of understanding the first chapters of Genesis. The book benefits from, and furthers, a very healthy trend in recent biblical scholarship to abandon a rigid Victorian theoretical paradigm, the “Documentary Hypothesis” and its descendants, which built an entirely new, and almost entirely speculative, construction on the meaning of the Bible and the whole history of Israel. Instead, the aim is now increasingly to concentrate on the text we have as an intelligently authored literature, rather than dissect its hypothetical sources. Maybe that needs to be done in other fields, like biology, too. In this case, the realisation is that Genesis 1-3 (in particular) do not stand alone either as disparate fragments of lost traditional myths, nor as educational treatises on how the world or humanity began, but as the introduction to a specific book, Genesis, which is itself the introduction to a larger work, the Torah (or Pentateuch to us) which is the foundation-text of the Hebrew Bible, traditionally ultimately from Moses’s hand on the border of the promised land. More on that anon, but Postell (a Messianic Jew himself) also makes a persuasive case for saying that the final version of the Torah was also consciously part of the final form of the whole Hebrew Scriptures, or Tanakh (which were usually arranged as “the Law”, “the Prophets” and “the Writings” ending with 2 Chronicles), presumably at some stage after the Babylonian exile and by someone with the kind of knowledge and authority of an Ezra. In other words, we ought to be open once more to the idea that the Old Testament is a book with a theme, not just a library of ancient Israelite musings about their God. Postell leans heavily on the excellent work by John Sailhamer here. That overall theme is clearly foreshadowed in the Pentateuch, and comes into sharp relief when you start asking the question, “Why start with the creation story, and why then the story of Adam?” The answer comes – pretty incontrovertibly, I suggest – when one looks at how Deuteronomy ends. Perhaps it’s obvious, or perhaps not, but this ending shows that the Pentateuch, as we have it in its canonical final form, is not actually primarily about how Israel made the covenant of Moses and got to the promised land. In fact it’s about how Israel were unfaithful to the covenant from the very start, and it ends with Moses solemnly prophesying that they will undoubtedly continue to rebel in the land of Canaan, that they will in days to come be exiled for abrogating the covenant, and that they need to focus on the hope, after that, of a new covenant of grace mediated through one who is to come. The rest of the Old Testament vindicates Moses by documenting that decline and fall, ending in the Babylonian exile just at the time the prophets begin to announce the New Covenant to be mediated through the coming Messiah. The final book of the Tanakh, 2 Chronicles, ends like Deuteronomy with a prophetic hint of that hope, as the exiled nation receives an edict from God’s “servant” king Cyrus, who has been given (for now) “all the kingdoms of the earth”, saying that he will rebuild the temple (though an inferior one, for now) and allow the exiles home (but still into, as Ezra’s prayer puts it, “slavery”). The prevalence of such a message in the Scriptures explains why there was such a profound Messianic hope amongst the Jews by the time Jesus came. One significant strand of that teaching, from the Pentateuch onwards, is that the purpose of all this goes beyond Israel to the whole world, for the whole earth is God’s. Adam, then, is an archetype not for “mankind” in some generic way, but for Israel in the very specific narrative the author considers so theologically important. Note that even the tree of eternal life in the garden is reflected in the hope of the resurrection at the restoration of the people introduced by Daniel and others. Postell goes into great detail to expand this picture, incorporating the role of Genesis 1 (which, at least typologically, also prefigures Israel as the sacred land of Canaan), and pointing out just how these themes are reiterated and emphasised in the whole Pentateuchal narrative, and indeed many of the historical episodes in the biblical history. Thus Abram, like Adam, the first major character in God’s plan to reverse his exile, is called by covenant from a foreign land into Canaan, albeit it without full possession. The first story about him involves him going to Egypt, getting into trouble over a woman, and being evicted, using language derived from Genesis 4. And so it goes on – there are linguistic and thematic parallels involving Jacob, Joseph, King Solomon and many others. No doubt, like most proponents of new theories, Postell overstates his case at some points, but the overall thesis seems to me clear from the overarching message of the Torah alone – Israel, like Adam, has failed and needs to look to the hope of God’s grace “in the last days” (the literal meaning of the phrase used in Deuteronomy) for their restoration from exile. The eighth century prophet Hosea makes the parallel explicit: “But like Adam they transgressed the covenant; there they dealt faithlessly with me” (Hosea 6.7), and he too, even before the exile of the northern kingdom, ends with the eschatological hope of restoration through transformed hearts. So to read the beginning of Genesis without perceiving its reference to Israel is to misunderstand it, and to see the link is to begin to see the depth of its meaning. But this raises a couple of potential problems. The first is that other, less conservative, scholars who have made a similar link between Adam and Israel, have concluded that he is therefore an allegorical and fictional character with no reference to actual historic origins. But in my view this is to misunderstand how archetypes function in ancient literature: stories are retold to bring out the parallels, but they only gain their power by being about real events. In this case we can see this in the “secondary” parallels to which Postell draws attention: Abraham, Lot, Jacob, Joseph, Moses, Solomon – all these and more are indicated in the text as embodying echoes of and parallels to this “call-covenant-disobedience-exile-hope” theme, yet that does nothing to diminish their being considered real people who experienced the things described. The message “You’re as bad as your father” loses all its force if he wasn’t like you at all. The second issue is one that – to my mind – Postell addresses less than is required. He follows John Sailhamer in regarding not only Eden and the garden of Genesis 2, but the whole “heavens and earth” of Genesis 1 as being literally, as well as typologically, about the physical land of Canaan. The problem then becomes how one makes a transition from “Adam as Israel still needing redemption from exile” to “Adam as all mankind needing redemption in Christ” as applied to the gentiles by St Paul. After all, Israel’s exile to Babylon doesn’t involve me, so why should the exile of their ancestor from the garden of Eden? This is an issue that’s interested me for a number of years – have you ever considered on what basis the specific promises made to Abraham and Israel, the Hebrew Scriptures and the promised New Covenant all suddenly become applicable to the whole world in Christ? I’ll tell you my answer sometime if you’re interested, but the same issue applies to “Adam as Israel’s exiled ancestor”. In what way is he, in that case, my exiled ancestor, from whose curse I need to be rescued as surely as the Jews needed to be delivered from exile by their Messiah? The provocative answer is that we need to be part of Adam’s story if the problem-solution posed by the torah and the other OT scriptures is to apply to us. Somehow it must be true not only that people are “sinners” in some vague sense, but that they were once taken from their original home to a place blessed by God’s special presence, and were exiled from it through rebellion. That is the problem from which the universalism implicit in Abraham’s call, and Israel’s after him, stems. The bottom-line answer is that all the discussions we have about Adam as a character in real history, although they are largely irrelevant to Postell’s entirely text-based approach, remain important questions for us as we grapple with biology, anthropology and so on. ANE literary questions still have relevance, the genealogical Adam hypothesis may be of importance, and questions still need to be raised about the age of the earth if Genesis has a historical basis. This entry was posted in Adam, Creation, Genealogical Adam, History, Science, Theology. Bookmark the permalink. Good Stuff. Michael Heiser has spoken about this topic before. Here is an old post about it but you will have to read the comments for more clarification. My question is what is the relevance of naming the animals and creating a help mate to the Adam=Israel theory. What is the relevance of forming Adam from the dust and not from another animal, and of God telling Adam and Eve that they and all the animals were to use green plants for their food (cf. Gen 1:29-30). You might wish to work towards your own answer to the first part by meditating on Ecclesiastes 3.18-21. All I get from Ecclesiastes 3.18-21 is that both man and beasts die. Ah – you didn’t notice that all men come from dust and will return to dust? Ah – but Eve didn’t come from the dust. And yet all her descendants did! Hmm, something mysterious going on here… perhaps metaphor? But that’s silly! How likely is symbolism in a story with a talking snake, eternal life and wisdom growing on trees, and God walking?? They’ll be telling us next that Ecclesiastes and Genesis are using the same imagery! Hi Hanan – good to hear from you. I have to confess that it was Heiser who put me on to Postell’s work. As to your question, I don’t think Postell addresses it directly (I’ve lent the book to someone now, so can’t check!). But bearing in mind he regards Adam as real, and not as a mythical or literary construction, the naming of the animals has to do with being given authority in the land, just as in considering Adam as the global progenitor, he is given authority over the world. Likewise, the provision of Eve serves exactly the same purpose as it always has in theology. One has to remember that in comparing Adam and Israel Postell (more than Heiser, in fact) is taking Genesis in its own terms, rather than trying to map it to world history. That is, his work is “What does Genesis mean?” rather than “How does Genesis fit into to ancient history.” So it might very well be that Adam, in his view, is indeed also the father of the entire human race in some way – the Pentateuch itself makes reference to that in several ways, including the table of nations, the role of Melchizedek and Jethro, etc. Yet to ignore the Hebrew context is bound to lead one into false tracks – rather like trying to see Jesus as some kind of universal sage/saviour appearing randomly in the world, without considering the Jewish Messianic context that makes sense of him. Its not ancient science but is witnessed facts on boundaries about origins. Science is a verb and not a noun. Just a thodology if it exists at all. I don’t think it does. JUST people thinking about things and drawing conclusions. Adam was to be perfect and live forever. things cwent wrong. Christ was a replacement for adam. Not a continuance. Israel was the people from who Christ was to come. Israel was the original church. The original evangelical protestants. A people with a future as breeding the messiah and having, in the meantime, a vibrant life with God and righteousness themselves. they were a flop and punished but Christ came. Yes Genesis is the account of mans beginnings with God, origins, and redemption. How does this interact with a genealogical adam? Is any one calling this racist too? They’d probably call it a Zionist plot if they got wind of it! How dare the Jews claim their Scriptures are about them! In fact it seems to me to leave the door open for many possible understandings of Adam, from a non-historical one (a view Peter Enns takes, I believe, in the context of “Adam as Israel”) to a literalist one, with genealogical Adam not excluded. I have a few thoughts about the universal implications in another post, which I’ll put up in a day or so – one of the astonishing things is that Israel’s role to bring God to the whole of mankind is integral to a holistic view of the Tanakh and Torah itself. If their interpretation is true, and Adam historical, then that universalism goes back to Adam himself – a pretty astonishing thing. “Hmm, something mysterious going on here… perhaps metaphor? –	of God telling Adam and Eve that they and all the animals were to use green plants for their food. Funnily enough I read a suggestion about that recently (though I don’t think it was in Postell – may have been one of the classical theologians). The gist of it was that Adam’s “raw material” emphasises that he is from and of the earth (literally, of course, in the sense that adamah is the soil). He is not a god, but like the animals (Gen 2.19). He rules the earth as part of it, not an alien invader. Yet the breath of God is also in him, so he rules on behalf of God. Eve, though, is created as Adam’s companion or counterpart, so she is described as deriving from him, not directly from the earth. In this way she cannot be seen as an alternative creation, with male rivalling female for power, but as part of the same creative act (as in Genesis 1, “male and female created he them”). Unlike the animals God shows Adam, she is not “other”, and so is the right one for him in his God-given role. At the same time, since that is the case, Eve’s “ultimate” raw material is the same as Adam’s, which is true also for Ecclesiastes’ description of each and every person descended from them. Given that symbolism (or any better symbolism someone might come up with) I don’t think the passage has anything to say on the detail of biological or evolutionary origins, except to exclude mankind as sttlers from another galaxy or something. Man and the animals are created from the same material, dust, which could be compatible with common descent, as it is in the thinking of Ecclesiastes, for whom we come from dust because we are descendants of Adam, who was created from dust. At the same time, we mustn’t forget that we are as different from animals as they are from each other, or more, because the “dust” is not the bottom line, but God’s creative act upon the dust. Long before Genesis was written, men and women already knew that both man and animals die and decay to dust. I don’t understand the purpose of the Genesis author giving various “dirty” details about the creation process when he could just as easily have said ‘And God created all things, including the animals and man’, and leave it at that. The dust analogy has no expecial reference to Israel that I can see – I was simply answering your own repeated question on it. Mankind as made from clay or earth has parallels in ANE literature, but in the Genesis case the strong link is between man and the productive earth, sharing the same name, and therefore “the land” – a big theme in the covenant and therefore, perhaps, the Israel link you’re after. The key to your “other thought” is the place Genesis has in the Pentateuch: otherwise, “God made the world” would be more than enough (“God made Israel” being more relevant to Exodus Hebrews). That has to do wiuth the organisation of Gen 1 around a temple-building account, and in opposition to pagan myths, to the world being made for mankind, serving God as a kind of viceroy and priest to creation. That’s where you have to start.